WIN! Moroccan Rose Otto Body Wash from REN, and Essie Chocolate Kisses! This Moroccan Rose Otto Body wash from REN, €20, is seriously lush. It leaves skin silky smooth and enveloped in the headiest, most luxurious scent. The fragrance is all natural, too, from Moroccan Rose Otto Oil, one of the world’s most expensive essential oils with reputed stress busting properties. No surprise, then, that this product has just been awarded the InStyle Best Beauty Buys award for best shower gel - for the tenth year in a row! REN are some of the good guys, too. Not only are their products free from nasties like synthetic fragrance and colours, petrochemicals and sulfate detergents, but they've just reduced prices for the Irish market, too. Check out this post on beaut.ie for the deets. 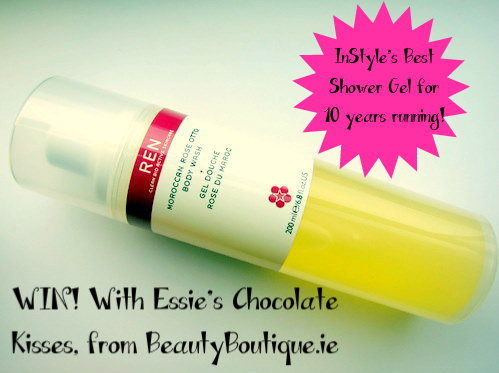 And now, thanks to Irish online beauty shop, BeautyBoutique.ie, one lucky reader of Fluff and Fripperies will get to sample this award winning body wash for themselves - along with a bottle of Essie's Chocolate Kisses nail polish, which I showed you here. They've donated this lovely little prize to celebrate their current promotion, where with every bottle of Moroccan Rose Otto Body wash purchased, customers receive a free bottle of Chocolate Kisses - normally priced at €11.99. 2. Leave a comment with an email address or twitter name where you can be reached if you win (if you don’t want to leave your email, just leave a comment and mail me on emma at fluffandfripperies dot com). Apologies to my international readers, but this giveaway is only open in the Republic of Ireland. (I have an international giveaway in the pipeline to even things out!) A winner will be selected at random and informed one week from today. Oh and in case you missed it on Twitter or Facebook, the winner of The Body Shop giveaway was Caren Kennedy - congrats Caren! I follow via blogger, thanks for this giveaway, I love Essie! Nice Prize. I've been following the blog for ages now. claire.s.kane @ gmail . com is my email (with out spaces). Fantastic giveaway. Thanks. Following via GFC and have tweeted. Of course i'm following via GFC! Sweet prize hun! As always, love the blog! Subscribed, Fan on Facebook, and Google friend! I'd love to win this! I'm a member of the site, but I don't have Twitter! I'm in so I might win again. Or are previous winners excluded from entering?! Either a great post as ever and have RT'd. You are spoiling us missus. Thanks for running another great giveaway. Keep up the most excellent work! Would love to try this as it sounds fab. following at mell61 on GF, sue mell six-one carroll on FB. Have you spotted the recent Ren advert, pretty steamy! Following with my twitter id - @niannah. Love the blog, and love Ren!